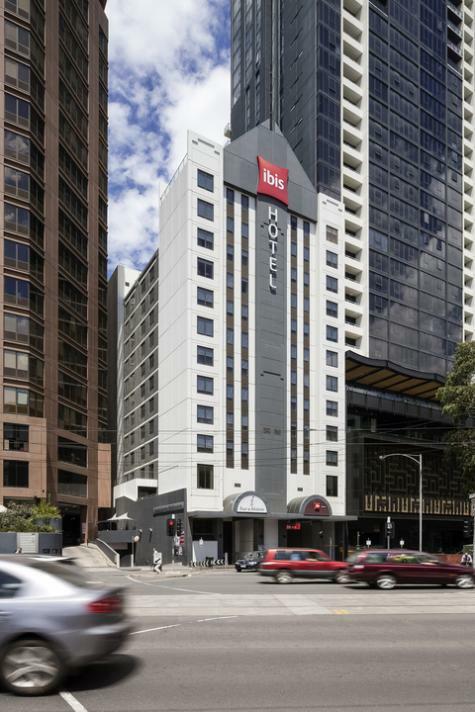 ibis Melbourne Hotels and Apartments offers great value inner city boutique accommodation, located in an ideal position just a few minutes walk from the famous Queen Victoria Markets, the legendary Lygon Street restaurant quarter and the central shopping district of Melbourne. This fully refurbished accommodation provides modern, spacious and comfortable non smoking 250 comfortable rooms including one and two bedroom apartments with a cosy bed, functional bathroom, climate controlled air-conditioning rooms, 4 accessible rooms, hair dryer in bathroom, high speed internet access line, spacious living area and kitchenette, queen size bed, in room safe, mini fridge, ironing facilities, television and tea/coffee maker. ibis Melbourne Hotels and Apartments guest and leisured facilities feature 24 hour check in, dry cleaning/laundry service, housekeeping, and tour desk, car parking with fees, elevator, disabled room, internet access and conference facilities. Guests can enjoy the onsite IBistro restaurant and bar which offers a hearty full buffet breakfast each morning and a succulent dinner with a snack menu available opened 24 hours daily. Relax and enjoy a few drinks in IBar open everyday from 3pm with "Happy Hour" from 4pm - 6pm with our specials. ibis Melbourne Hotels and Apartments is ideally located on the very cusp of the CBD and Carlton; the Italian precinct, and is within easy walking distance some of Melbourne's trademarks such as the famous Queen Victoria Markets, the legendary Lygon Street filled with authentic Italian cuisine restaurants, the newly revamped Melbourne Central Shopping district, Queen Victoria building, Bourke Street Mall and much more this vibrant city has to offer. Major sporting venues like the MCG, Etihad Stadium and the shopping hubs such as Bridge Road, Chapel Street, Brunswick Street are only a tram ride away. 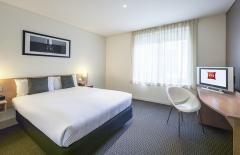 Whether its business or pleasure ibis Melbourne Hotels and Apartments offers all the luxuries, warmth and hospitality you would expect from a quality hotel. Accessible Facilities: Disabled room(s) available on request.